What is Cryogenic Specimen Preparation? In this instance we are referring to frozen hydrated bulk specimens for Scanning Electron Microscopy (SEM), commonly termed Cryo-SEM. 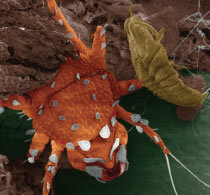 The Scanning Electron Microscopist is faced with the inescapable fact that liquid is a fundamental part of practically all lifesciences – and many materials – specimens. 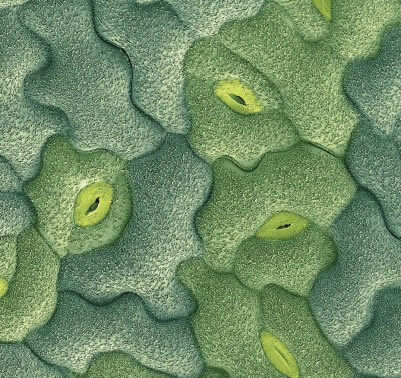 Since water occupies up to 90% of some animal and plant tissues it represents a most formidable specimen problem to most Microscopists. 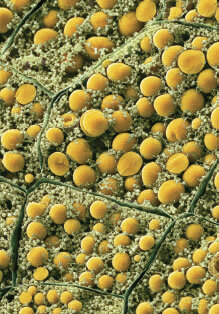 Cryo-SEM is a quick, reliable and effective way to over come these not inconsiderable SEM preparation problems. Additionally the technique is widely used for observing 'difficult' samples, such as those with greater beam sensitivity and of an unstable nature. An important application, often overlooked, is the ability to use cryo-SEM to study dynamic processes (industrial or otherwise) by using a series of time resolved samples. Naturally the advent of various "high pressure" modes, such as VP, LV and ESEM has allowed such samples examined in SEM without resorting to freezing or drying methods. However, cryo-SEM is still by far the most effective method of preventing sample water loss, which will in fact occur at any vacuum level –even with Peltier stages fitted to the SEM and the careful addition of water vapor in the SEM chamber. Cryo-SEM also has a number of a additional advantages, including the ability to fracture and selectively remove surface water (ice) by controlled specimen sublimation. 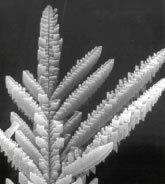 Cryo preparation techniques for scanning electron microscopy (SEM) have become essential for the observation of wet or 'beam sensitive' specimens. Using such techniques removes the need for conventional preparation techniques, such as critical point drying or freeze-drying, and allows observation of the specimen in its 'natural' hydrated state. The specimen is rapidly cooled and transferred under vacuum to the cold stage of the preparation chamber, which is mounted onto the SEM chamber. The preparation chamber is pumped either with a rotary pump (91005) or by a specially designed turbomolecular pumping system. The specimen can be fractured, sublimated ('etched') to reveal greater detail, and coated with metal by sputtering or with carbon by thermal evaporation. Finally, the specimen can be moved under vacuum into the SEM chamber where it is easily located on a cold stage specifically tailored to the SEM. At all stages of the procedure the specimen is maintained at a 'safe' temperature of typically lower than -140°C. Biological sciences including botany, mycology, zoology, biotechnology and biomedical – plus economically import agricultural sciences. More recently cryo-SEM is becoming an essential tool for pharmaceutical, cosmetics and healthcare industries, where it is used in basic applied research and for routine QA of many products, such as creams, cosmetics and drug delivery systems. 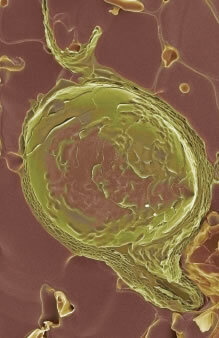 Cryo-SEM has long been a standard preparation method in the food industry. Of interest are multiphase products, such as ice cream, confectionery and dairy products. 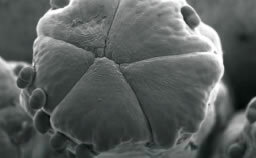 Botanical: Cryo-SEM is the perfect method for highly hydrated botanical material. This technique is used for leaf specimens etc. Roughen stub surface with fine emery paper. Specimen is laid on top of mounting media. This technique is used for edge observation and fracture. Roughen surface of stub with fine emery paper. Specimen is placed on its edge in a machined slot and secured with mounting media. This technique is useful when a small specimen would be obscured by the Tissue-Tek mounting media, or when specimens need to be recovered. Specimens need to be slightly damp to use this method (good for nemotode worms). The specimen is laid on surface so that its dampness slightly dissolves the film emulsion allowing the specimen to adhere to the film surface. Exposed unused film with the emulsion side uppermost is secured to the stub with mounting media. It may be useful to scrape off the protective coating of the film emulsion first to assist conductivity. For liquids and for when specimens need to be frozen off the stub to achieve fast freezing rates. The rivet is placed in the hole and filled with liquid prior to freezing. 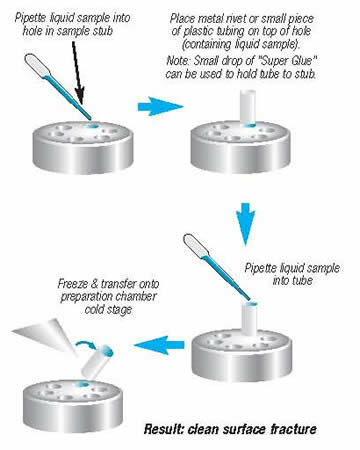 If the specimen needs to be frozen away from the stub, two liquid-filled rivets are held together and then frozen prior to transfer onto the stub. Cryo-FIB/SEM. 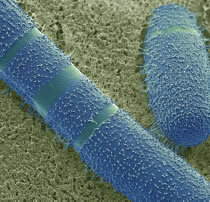 Image courtesy of Hannah Edwards and Arabidopsis plants provided by Darren Wells, Centre for Plant Integrative Biology, School of Biosciences, University of Nottingham, UK. This image illustrates a stable emulsion of a synthetic liquid polymer dispersed in an aqueous continuous phase. EMS PP3010T Cryo-SEM Preparation System is available online from the EMS Catalog. For ordering or product information, click here.